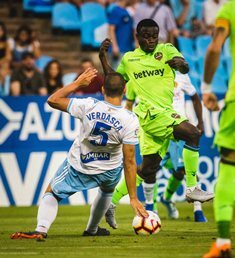 Super Eagles winger Moses Simon had a promising debut for Spanish La Liga side Levante in their 6-2 defeat to Sevilla on Sunday after his shot resulted in an own goal for coach Paco Lopez' team. Simon who has never played for Levante after joining from Belgian side Gent since copping a hamstring injury was a second half substitute in place of Spanish midfielder Campana in the 73rd minute. His effort came on the dot of 90 minutes after he controlled the ball brilliantly with his chest before swiveling to hit a shot with his left foot that deflected off Danish defender Simon Kjaer. He played a total of 2, 433 minutes of league football in his last season in Belgium before the move to Levante. Simon has now overtaken ex-Real Madrid youth-teamer Christopher Ohenhen as the 18th youngest Nigerian player to debut in the Spanish topflight, aged 23 years, 2 months and 11 days. Wissam Ben Yedder (3), Daniel Carrico, Andre Silva and Pablo Sarabia scored for Sevilla while Roger Marti was on target for Levante after he restored parity following Yedder's opener. The defeat was the heaviest suffered by the Levante manager, Lopez.